Meet the Peabody Sisters from the 19th Century. You probably haven’t heard of them. That’s the problem. 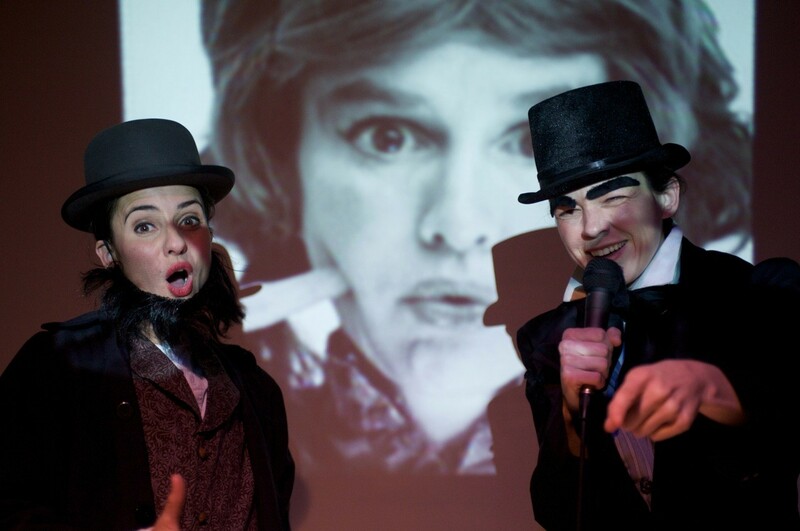 This new original performance uses this remarkable family of female intellectuals and artists as a springboard for a vaudevillian fantasia on being a woman, an artist, an intellectual, and an American. The world premiere took place in Live Arts‘ UpStage in December 2009. Kay Leigh Ferguson originated the roles currently played by Kara McLane Burke. Well, it was probably a foregone conclusion that we would decide to embark on this year + experiment of endurance and teamwork. We aren’t exactly known for choosing the most prudent, fail-proof courses of action. Rather, I think we are sort of jazzed by the proposition WHAT IF (it all goes to hell in a hand basket)? So, everyone got her own copy of our source book; we gave our project the working title Transcendental America; and we were off to the races! Or not. It certainly has not been a speedy process. Building actor-created material, developing and honing in on our exact themes, creating text, combining action and text…This is slow, but satisfyingly deep work. Over time, we decided that our project would focus on the 19th, 20th and 21st century experience of growing up as an American female, instead of our more noble initial impulse: to stage a historical re-visitation of the ideas and philosophical writings of the Transcendental thinkers. Because, well, humph. That’s mostly a bunch of talking suits. We wanted to get up close and personal with our gals! The more we explored, the more we felt a deep kinship to the personal spirits of the Peabody sisters – as girls growing up, reaching that critical age of decision (to marry or not?! ), and all the struggling that each endured in an attempt to fit her female square peg into the round hole of the man’s world. Sexually speaking, I probably have my metaphor exactly backwards, but we all recognized in ourselves the same desires — to be loved and adored as women while, simultaneously, following our own independent passions as artists and successful individuals. As we noticed that this dilemma was never actually resolved for any of the Peabody sisters, we humbly admitted that we, here in the way liberated 21st century America, don’t feel resolved about HAVING IT ALL either. We tend to develop performance ideas through a wacky lens, so we doused our examination of this dilemma with liberal doses of extravagance and humor. We may not have resolved the question of HAVING IT ALL, but we can surely laugh at ourselves and Our Ann Sisters – laughing with a deep sense of empathy and connection to all of our sister- gals everywhere. Sisters, we heart you! And we salute you! We’ve come a long way, baby! The entirety of the performance you are witnessing tonight, Our American Ann Sisters, is what we in Performers Exchange Project (PEP) call the play. The words we utter during the performance constitute what we call the text. To us, it is an important distinction. In the most common form of American theater, the piece of writing called the script dictates most of the action and sense during the performance. In our work, on the other hand, the action and sense derive from the physical action of the actors in juxtaposition with the text. Without the actors’ scores of action, which they have created separately from the text, the action and sense of the play would not exist. Out of a process that now feels like pure alchemy, I wrote the text of Our American Ann Sisters, with heavy guidance and direction from Martha, following hours of table discussions with everyone in PEP and guest artist Kay Ferguson. It features contributions from local writers Wistar Watts Murray, Browning Porter, Matthew Farrell, Walter Lundwall, Shannon Worrell, and our own Sian Richards. We also conducted two community workshops to solicit text and were inspired by and grateful to the many local playwrights who responded to our call for submissions. The text draws from many other sources, most notably scholar Megan Marshall’s landmark biography The Peabody Sisters. Other sources include historian Annie Marble, feminists Margaret Fuller and Betty Friedan, screenwriter Jack McGowan, author Judy Blume, William Shakespeare, cookbook author Mary Mann, novelist Henry James, dating “experts” Sherry Schneider and Ellen Fein, artist Frida Kahlo, comedienne Phyllis Diller, comedians Don Rickles and Foster Brooks, and let’s face it, where would this text be without Wikipedia? And now for something completely different. No, it’s not Monty Python. 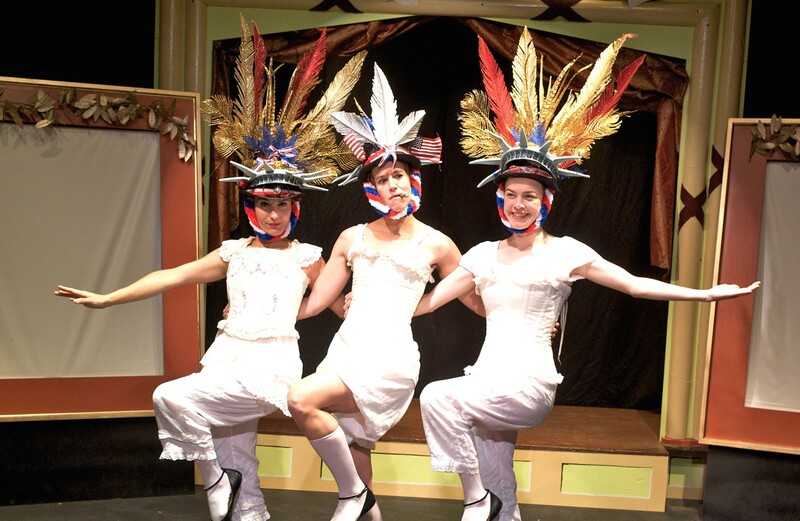 It’s “Our American Ann Sisters,” which had its world premiere Friday in the Live Arts Upstage. This is performance, but not a play. It’s theater in its purest sense, performance with text (and context, and even subtext) but no script, a story informed by performance rather than the other way around. It’s women gone wild, aided and abetted by men in lesser roles or entirely offstage. Though the show is in the Live Arts space, it’s a product of the Performers Exchange Project. 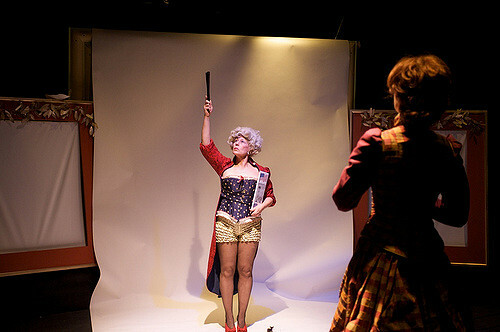 The group as such came to be in 2005, but its founders and members (Martha Mendenhall, Sian Richards, Jennifer Hoyt Tidwell, Kara McLane Burke and Doreen Bechtol) are area theatre veterans, sometimes in more conventional work, sometimes with other unconventional groups, including Foolery and the Zen Monkey Project. As time, work and creativity transcended that idea, it morphed into a focus on the “19th-, 20th- and 21st-century experience of growing up female.” And that led the group to three American sisters – Mary, Sophia and Elizabeth Peabody, women who all made significant impact on the America of the late 18th and early 19th centuries, and who certainly transcended the expected roles of women of the time. Don’t worry. It’s still really funny, because one thing women have learned over the years is to laugh at our lives, even when they seem least laughable. There’s no way to know whether the sisters would have laughed at these very liberal interpretations of their lives, but they certainly would have supported something – almost anything – different from the status quo of the society into which they were born. The show defies description, but is structured into three segments, each focusing on one of the sisters. 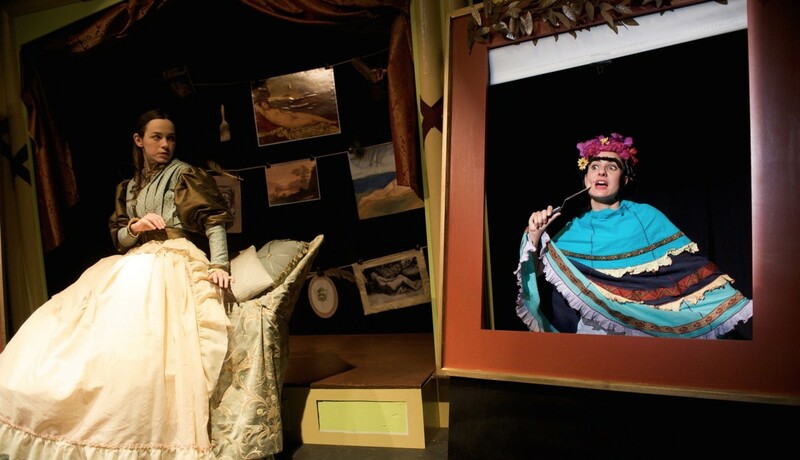 They all have their moments, but a favorite is the second of the three, focusing on on artist and semi-invalid Sophia Peabody (Sian Richards) just before she weds Nathaniel Hawthorne (yes, that Nathanial Hawthorne) – and influenced by, among others, Phyllis Diller and Frida Kahlo. One of its funniest elements is her costume – or is it the set? What makes it work so well is that Richards remains in character, though the character is admittedly a little wacky. In fact, a strength of the show is that most of the performers play the ridiculous completely straight, without unneeded accessories. An exception might be Kay Ferguson, who’s not a regular member of PEP but who participated in this project. Her bio notes that she’s studied clowning, so she acts as sort of a ringmaster for this circus of ideas. Jude Silveira takes his role as the Beautiful Assistant quite seriously, so he’s very funny. This is creative theatre at its finest, with a whole host of creative minds to credit. Kara McLane Burke is listed in the program as the person who “cajoled and maintained” the director and performers, while Mendenhall conceived and directed the show and Bechtol, Ferguson, Tidwell and Richards created and performed it. John Paul Scheidler’s set couldn’t be better, nor could Jenny McNee’s costumes, especially when one of them marries part of the set, making for laughs and a good point.